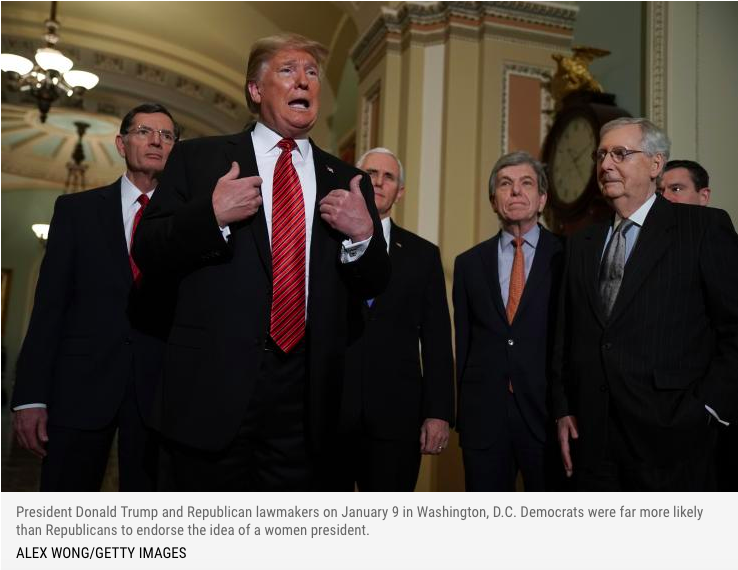 A fair share of Republicans in America would not be comfortable with a woman holding the country’s highest office, a new poll released this week has shown. Meanwhile, Democrats were largely comfortable with the idea of having a woman in the Oval Office. There was a stark divide along party lines. Democrats were far more likely to endorse the idea of a women president. Eighty-seven percent of Democrats expressed some level of comfort with the idea of a female president—72 percent said “entirely comfortable” while 15 percent said “somewhat comfortable.” Just six percent expressed some degree of discomfort. The poll from YouGov/The Economist surveyed 1,500 U.S. adults from January 6 through January 8. It had a margin of error of plus or minus 3.1 percentage points. Obviously, there has never been a woman president. Hillary Clinton, the 2016 Democratic nominee, became the first woman to secure a major party’s nomination. In the end, of course, she lost out to President Donald Trump. A number of women are considered viable contenders for the 2020 Democratic presidential nomination, including Massachusetts Senator Elizabeth Warren, California Senator Kamala Harris and New York Senator Kirsten Gillibrand. Warren has already formedan exploratory committee and made hires.